Is the Google Home Max worthy? Getting a review unit late, as is the case with the Google Home Max, gives me the benefit of reading a lot of people’s opinions of a product before I formulate my own. And reviewing a lot of similar speakers before I evaluate the one at hand gives me a broad base of experience upon which to formulate mine. Based on those two fronts, the Google Home Max has been praised just a wee bit overenthusiastically. That said, the Google Home Max is the best smart speaker I’ve heard. Amazon certainly has nothing close to it in terms of audio performance, and neither do any of the manufacturers building Echo clones. Expectations for Apple’s upcoming HomePod are certainly high, but compared to many other comparably sized, self-powered multi-room speakers—the second-generation Sonos Play:5 being the perfect example—the Google Home Max isn’t as remarkable. I’ll go over my listening tests first, and then dive deeper into the speaker’s specs and features. Listening to Steely Dan’s “Babylon Sisters” from the group’s Gaucho release, streamed via Tidal Hi-Fi in my home theater, I was impressed with the Max’s musicality. The laconic bass line that opens the track sounded satisfyingly fat, and the drummer’s rimshots cut through with authority. The vocals—especially the tight harmonies of the female backup singers—exhibited a thoroughly enjoyable presence, too. The Sonos Play:5 is just a bit larger than the Google Home Max and it sounds slightly better, but it also costs $100 more than Google’s speaker. But when I performed an A/B comparison to the aforementioned Sonos Play:5, the Max was outclassed at both ends of the frequency spectrum. Bass played through the Play:5 resonated in my chest in a way the Max couldn’t match. And when I switched to Tower of Power’s decidedly more upbeat “What is Hip?” from the band’s eponymous self-titled album from 1973, the Max again couldn’t match the Play:5’s bass performance, failing to bring Stephen “Doc” Kupka’s bari sax to the fore, and delivering Mic Gillette’s and Greg Adams’ exhilarating trumpet work with just a wee bit less energy. You can manually boost or cut the Max’s bass and treble levels plus or minus 6dB, but Google says the Home Max’s audio performance will automatically improve over time. The speaker uses its onboard microphones to evaluate the environment it’s playing in and will tune itself accordingly. 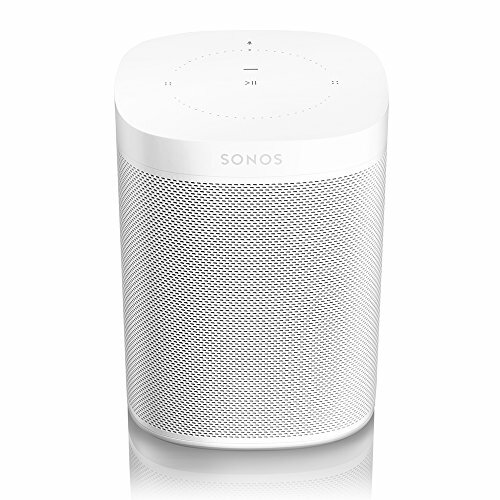 Sonos speakers have a similar feature, called TruePlay, but it’s dependent upon your having an iOS device and a willingness to spend a few minutes walking around the room with it while the speaker plays test tones. Sonos says its iOS device requirement is due to the wild diversity of microphones in the Android world—there’s not one standard component that the company can depend upon (and most of its speakers don’t have on-board mics). TruePlay is extremely effective, but I can’t evaluate Google’s tech because there’s no way to perform a before-and-after test when the tuning is going on all the time. 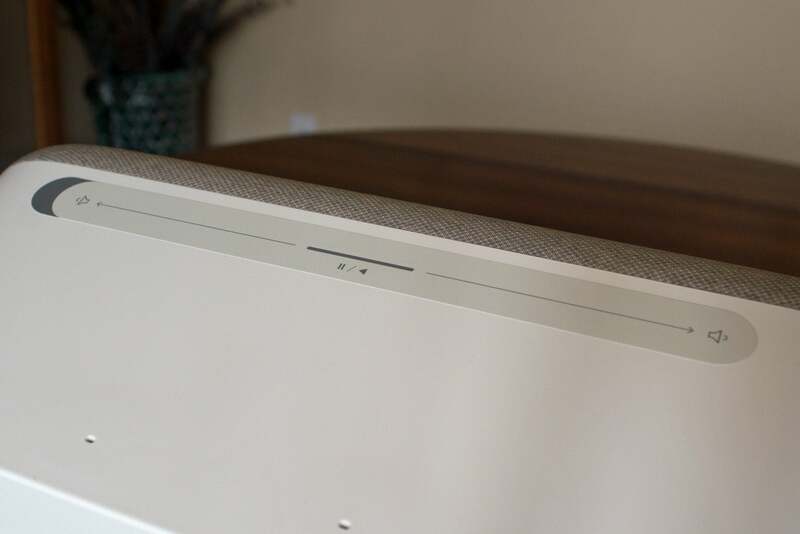 Compared to the Sonos One—the only true smart speaker in Sonos’ stable—or any other smart speaker, for that matter, the Max is a sonic superstar. If I didn’t have the Play:5 to compare it to, I’d have little or no criticism of the Max’s musical performance—especially for the price tag, which is $100 lower than that of Sonos’ flagship speaker. We’ll have to wait a few weeks to see if Apple’s HomePod can knock the Google Home Max off its sonic perch, but we already know that that speaker won’t support multi-room audio—at least not right out of the box. 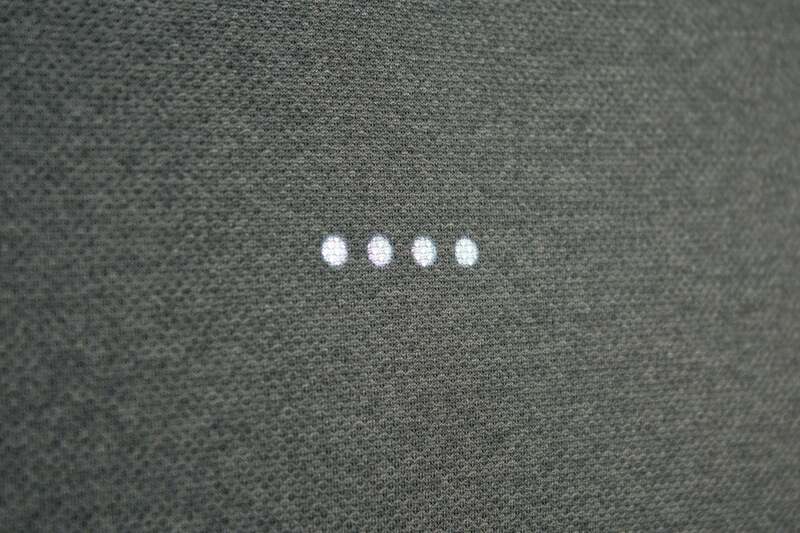 This row of LEDs beneath the Google Home Max’s cloth grille provide a visual cue that the speaker is listening for your command. 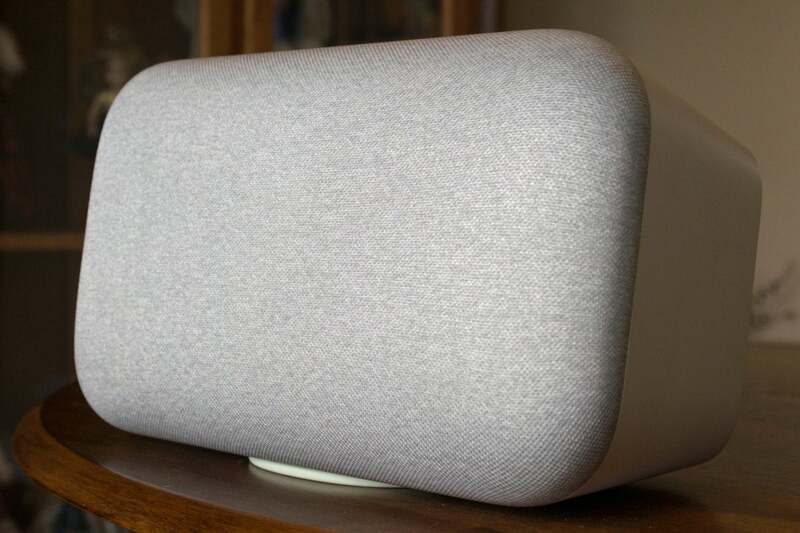 The Google Home Max is a beefcake of a speaker, with an enclosure measuring 13.2 inches wide, 7.4 inches high, and 6.0 inches deep. It tips the scales at a hefty 11.6 pounds. Google provides a generous 6.5-foot power cable with a diminutive two-prong plug at the end (death to wall warts! ), which makes the speaker easy to place. You can orient the cabinet either horizontally or vertically, moving a magnetic silicone furniture pad to either the broad side or the narrower right-hand side (where the power cord attaches) that will become the speaker’s bottom. Two of the Max’s far-field microphones are on the left side, so you wouldn’t want that to become the bottom. There’s a touch-sensitive volume slider on the top of the speaker (the right-hand side when vertically oriented), along with touch-sensitive play/pause. There are no physical controls for track forward/track back, but you can, of course, accomplish that with voice commands. The speaker is remarkably adept at hearing the “Hey Google” wake word even when it’s playing music loudly. This touch-sensitive strip on the top of the speaker controls the volume and can play/pause your music. Inside the Max’s sealed polycarbonate cabinet you’ll find a pair of 4.5-inch aluminum cone, high-excursion woofers with dual voice coils, along with two 0.7-inch polyester dome tweeters. These are powered by six Class D amplifiers: Each woofer gets two amplifiers, and the tweeters get one apiece. The amps have onboard DACs capable of supporting up to 24-bit/192kHz bit streams, although Google says it’s only tested sampling rates up to 48kHz (that’s where Sonos speakers max out, too). The speaker supports the FLAC, HE-AAC, LC-AAC+, MP3, Opus, Vorbis, and WAV (LPCM) codecs, but not aptX or aptX HD. You can link two Max’s to create a stereo pair, but Google sent only one, so I wasn’t able to test that feature (you can do the same with a Play:5, and I haven’t tested that either). I did test a multi-room (well, two-room) scenario, grouping the Max with a first-generation Google Home. Playing the same song on both speakers—with the Google Home in my home office and the Google Home Max in my home theater about 35 feet away, separated by several walls—I noticed an almost imperceptible delay that I don’t think would bother anyone. That said, I haven’t tested any multi-room speaker system that plays in sync better than Sonos does. As I mentioned earlier, Apple’s HomePod won’t support multi-room audio until Apple fully releases its AirPlay 2 protocol. The Google Home Max connects to your Wi-Fi network via a dual-band (2.4GHz/5GHz) 802.11ac Wi-Fi adapter. That’s a good feature, because the 2.4GHz spectrum is exceedingly crowded and subject to interference from home appliances such as microwave ovens. Alternatively, you can plug in a USB-C-to-ethernet adapter if you want to hardwire it to your network. 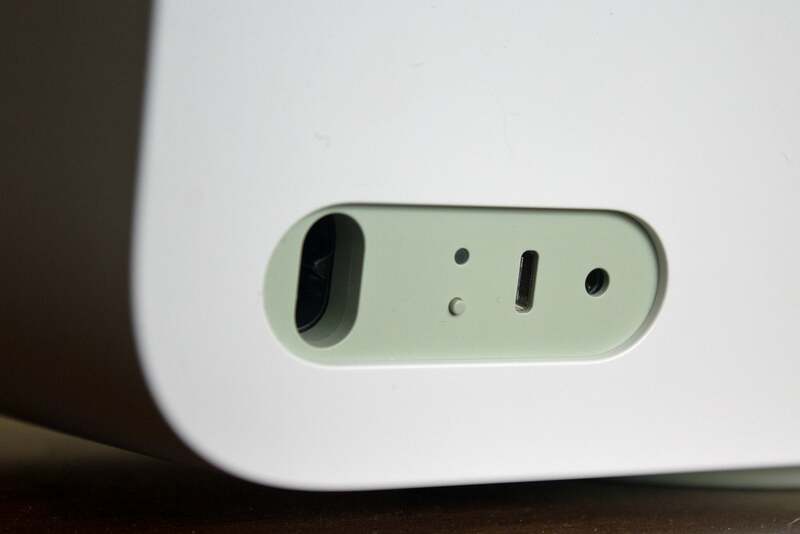 You can use this same port to charge a mobile device (not at the same time, of course). 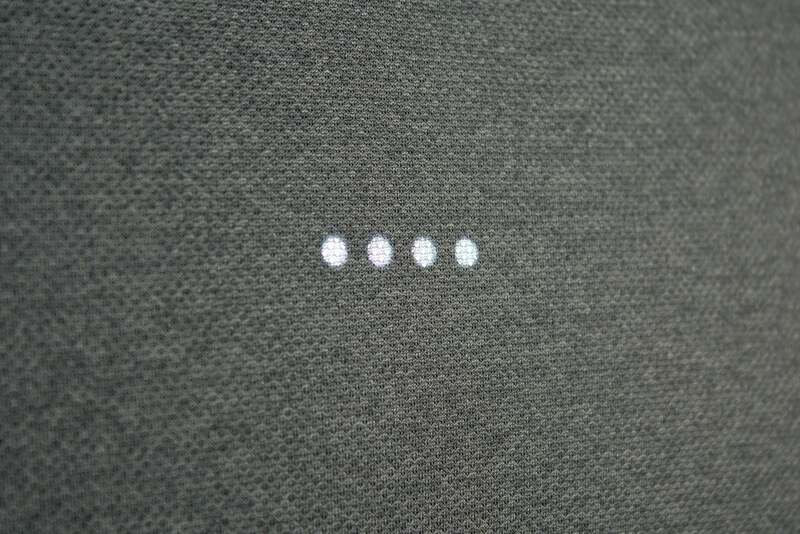 Every Sonos speaker has an ethernet port, but none can charge a mobile device. None of Amazon’s Echo models can be hardwired to a network, and none has a USB charging port. Unlike any of Amazon’s smart speakers, the Google Home Max can be hardwired to your network via a USB-C-to-ethernet adapter. The USB port can also charge your mobile device (though not at the same time). As with Amazon’s Echo speakers, the Google Home series puts much more emphasis on music services than on personal collections stored on your home network. You can use Google Play Music, YouTube Music, or Spotify with it, as well as Pandora, TuneIn, and iHeartRadio. If you wish to use other services, such as Tidal, you’ll need to “cast” music to the speaker from that service’s app. I set up the speaker to default to my Spotify Premium account, but I used Tidal Hi-Fi for my music evaluation because it streams music at much higher resolution (FLAC). The Google Home Max does not support Tidal’s even higher-resolution MQA streams. Apple’s HomePod will reportedly support only Apple Music. If you want to stream music you own—tracks stored on a local NAS box, for example—you’ll need to use an app, which you can launch from within the Home app if you choose. I added a button that launches Plex on my Android phone and “cast” music stored on a WD My Cloud Mirror to the Google Home Max using Plex Media Server. Sonos has the gold-standard app for managing and streaming music to its speakers, even if the company seems intent on de-emphasizing it in favor of allowing its users to stream directly from services such as Spotify and Tidal. As with every Echo except the Echo Plus (which has a ZigBee radio onboard), you’ll need a smart home hub in addition to the Google Home Max to control most smart home devices (i.e., anything that doesn’t operate over Wi-Fi). 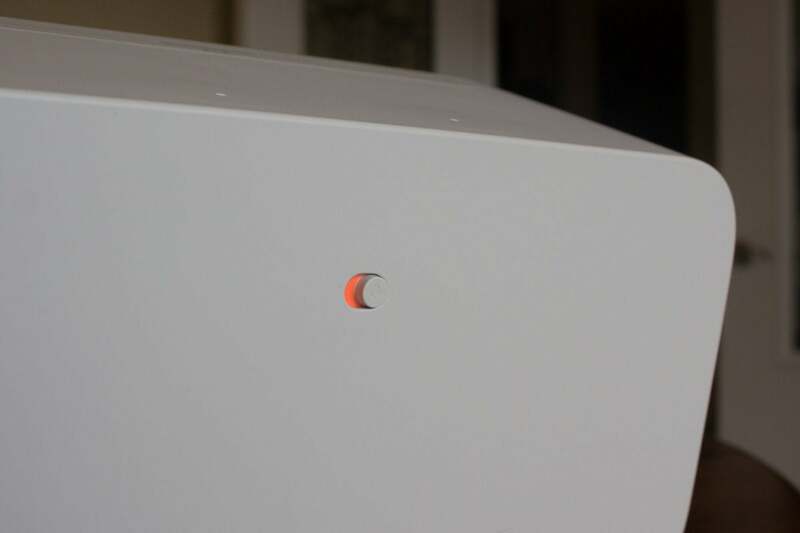 But I don’t see that as a shortcoming, and my opinion of Google Home for smart home control evolved—considerably—after my smart home service provider (Vivint Smart Home) changed the way it works with Google Home on January 8 of this year. Reaching around the back of the speaker to mute its mic isn’t the most convenient scenario, but it’s an action I rarely find myself performing in my home anyway. Under the previous model, controlling my smart home devices via Google Home required me to say “Okay Google, ask Vivint to…” turn on a light, lock the front door, or what have you. Google Home would reply “Sure, here’s Vivint.” A second voice would then say “Okay, turning on your light.” Awkward, right? Vivint’s new Google Home integration is much closer to the way it works with Amazon’s Alexa. I now need only say “Hey Google, turn the kitchen light on,” and it turns on. I still find the Google Assistant to be unnecessarily verbose as it performs its tasks, though. Where Alexa says simply “OK” as it fulfills my request, Google Assistant says “Sure, turning the kitchen light on” or “You got it, dimming the theater sconces,” and so forth. I don’t need a play-by-play, Google. Just do as I ask. You’ll only want to invest in one smart speaker ecosystem. That leaves Google at a bit of a disadvantage because it doesn’t have anything with a display in its arsenal that can compete directly with Amazon’s Echo Show or Echo Spot. 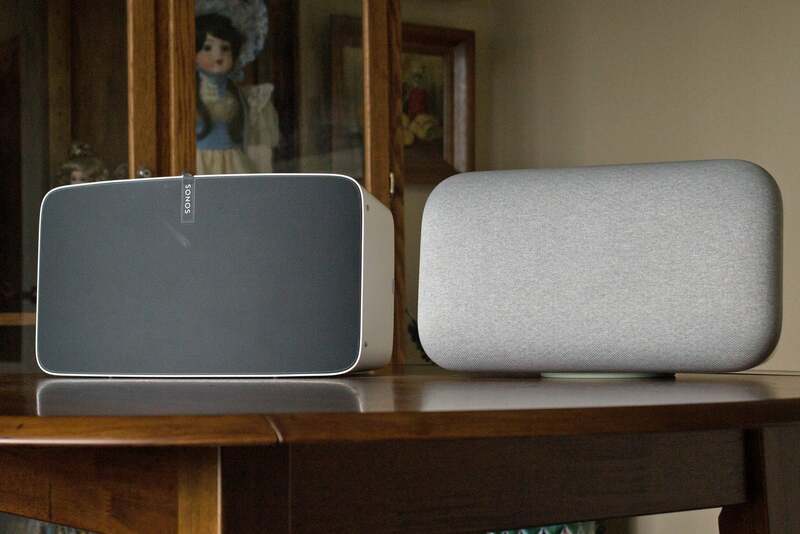 The company surprised everyone, however, with CES announcements of third-party Google Home speakers with integrated displays. Lenovo said it would ship its Lenovo Smart Display in July, and JBL announced its Link View will have an 8-inch touchscreen and a front-facing camera when it ships later this year. Sony and LG made similar announcements. Still, offering something later this year can’t compete with a product you can buy today. If your household consists of heavy Chromecast users, on the other hand, the Google Home Max will be a natural fit. Google has done a great job of integrating its smart speakers with its media-streaming ecosystem. If you’re a Sonos household, you’ll eventually be able to control your Sonos speakers using Google Assistant in the same way you can use Amazon’s Alexa today. But like the third-party Google Assistant speakers with displays, that’s a feature that can’t be evaluated today. Based on what can be evaluated today, the Google Home Max is the best-sounding smart speaker on the market. While Google Assistant stumbled out of the gate in terms of some smart home integrations, recent development has put it much closer to being on a par with Amazon’s Alexa. You’ll find plenty of other “dumb” powered speakers that sound better, and Sonos remains my mainstream top pick for multi-room audio, but the Google Home Max is definitely an up-and-comer.